Glen Falls is always a tough location for portraits. It is sunken in and lighting is not so great. We decided to start this family session when it got dark out. This way, we would not have lighting issues because we would be adding in the lighting ourselves. It actually worked out really well for these portraits. The Saikal family was so fun to photograph. Everyone was so photogenic. They were up for anything too! They wanted some simple portraits and then some really fun images too. We always do entire family photos, then we do solos and different combinations with the family. We like to mix it up. This little guy was just like his father. We had dad bring his foot up onto the rock and his son followed suit right away. He wanted to pose cool like dad! He could sure pull it off too! You can see the image is pretty dark. 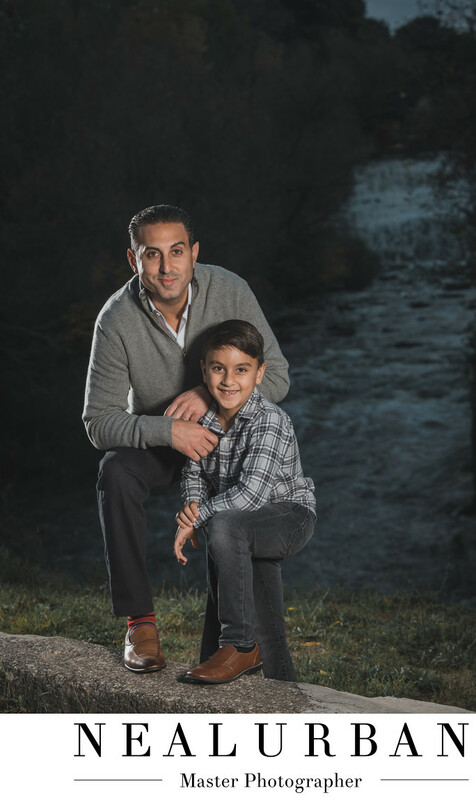 We wanted the lighting to be positioned right on the father and son and not so much the surroundings. It was a bit more manly. For the ladies, we lit more of the background to make it feel brighter and girly. Neal loves a challenge when we take photos. We know when going to Glen Falls we have our work cut out for us. It is such a beautiful location for photos and we never want to steer people away from going here. We just let them know we slow down the session to work with lighting to give them amazing images! Location: 5565 Main St. Wiliamsville, NY 14222.